LG recently released its latest flagship smartphone, the LG G7 ThinQ, which, like flagship smartphones from many other manufacturers, includes a high-quality dual-lens camera that enables impressive photographic capabilities. 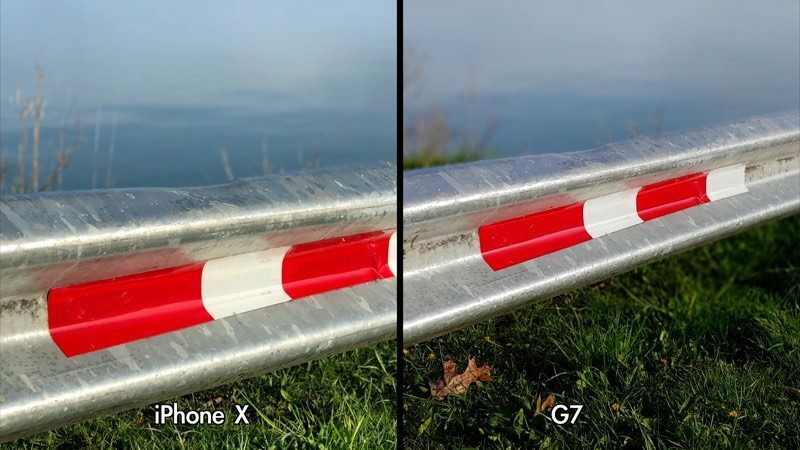 In our latest YouTube video, we pitted the G7's camera against the camera of the iPhone X to compare and contrast the feature set and image quality of the two devices. 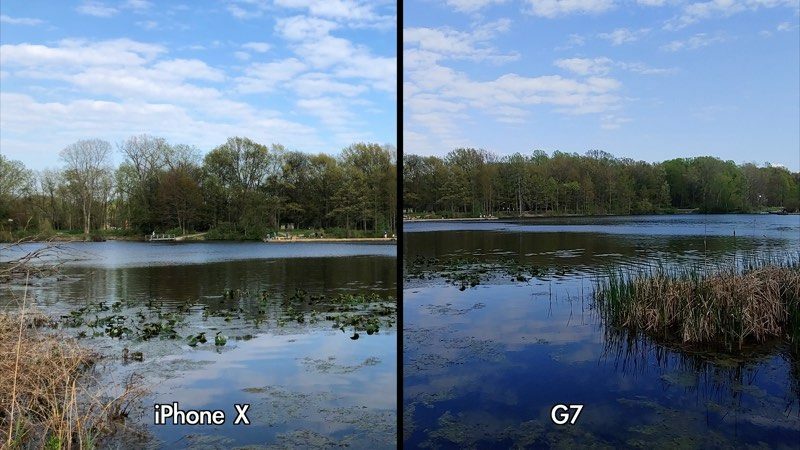 While the iPhone X has a dual-lens setup that includes a wide-angle and a telephoto lens, the G7, like the G6, takes a different approach for its camera setup, introducing both a standard ~71-degree f/1.6 wide-angle lens and an even wider f/1.9 107-degree lens, eschewing telephoto capabilities all together. Both sensors offer an improved 16-megapixel pixel count, and the standard lens includes support for optical image stabilization and an autofocus system that includes phase detection and laser. Apple's iPhone X has a standard 12-megapixel f/1.8 wide-angle lens paired with a 12-megapixel f/2.4 telephoto lens, which is what Apple uses for its Portrait Mode depth effects. Both wide-angle and telephoto lenses have their purposes, and with LG's setup, you can take wider landscape shots that fit more of the background in rather than closer portrait images designed to focus on a single subject. LG's device also includes a portrait mode-style effect, but the background blurring is done entirely via software rather than through lens technology. LG has included a unique "AI Cam" feature that's designed to analyze the subjects in the photo and offer up recommendations on how to make adjustments for the best possible photo. The native camera app on the LG G7 has an option for manual operation and several included photographic modes, while taking manual shots on the iPhone X requires you to download a third-party app. 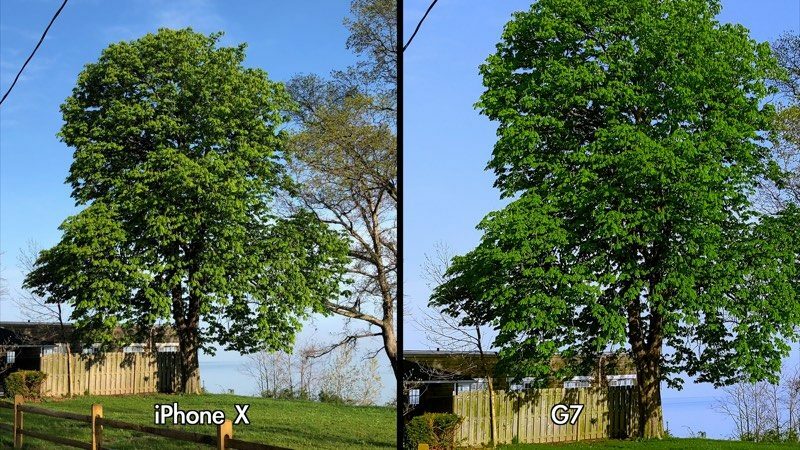 The LG G7 and the iPhone X are both capable devices that take high-quality photos, so you won't go wrong with either one of these smartphones. We largely preferred the look of the iPhone X photos because of its tendency to capture more natural colors and accurately capture images with a lot of variation in lighting without overexposing elements of the photo, but in a lot of cases, the camera you like best is going to come down to personal taste. What do you think of the LG G7's camera? Let us know in the comments. Pixel 2 and s9 are laughing at this thread. The iPhone appears* to have a wider field of view, reveals more detail in the shadows, and seems to produce sharper images; aspects that are important to me making photographs. * It's unclear what's going on. Were some of the images cropped (in camera or in post) and/or not taken from the same location? That makes comparisons difficult. Well, now I know which phone camera to use for my study of highway guardrails. But, for normal users, you might want to compare some pics of human faces, kittens. and plates of food. The iPhone X wins by a mile. The G7 photos are so noisy I had to close my laptop before I lost an eardrum. I dislike “whatever” articles like this where the conclusion is that they’re both great and you should just choose whatever you want — thus defeating the entire purpose of the article. 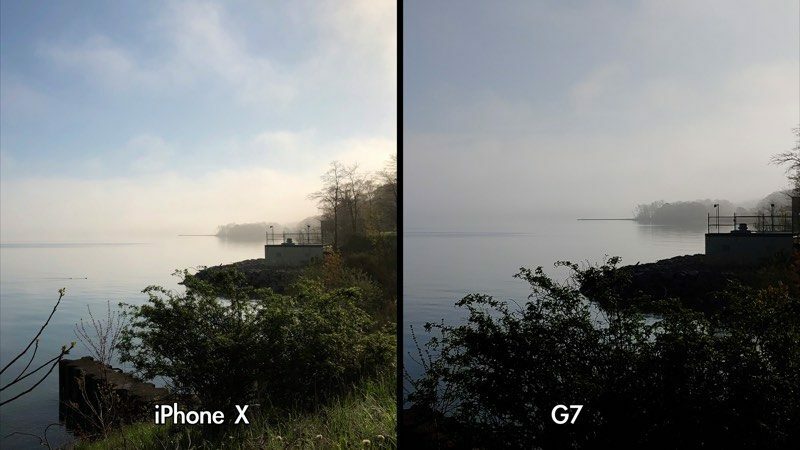 Too many sites have forgotten that the point of these exercises is to figure out which one is actually better, and in this particular case the two phones involved couldn’t have made it any easier: the G7 photos look awful compared to the iPhone X. So why not just say so? The ThinQ might have some entirely separate features that make it a better choice for some people, but on the camera aspect this article makes it plain which phone is going to give you better shots in natural-light outdoor photos. Why MR doesn’t state the obvious is puzzling, but the fact that all the photos featured in this article were outdoor natural-light shots should have been noted, and indeed the article would have been much improved by taking photos under other conditions (indoor with flash, indoor with no flash/low light, indoor with good light, portraits, and macro shots leap to mind) to make a fuller comparison. If you’re going to really compare these cameras, do the whole job. If there’s not time, that’s fine — but at least make sure the headline or first paragraph makes clear that it’s a very limited comparison, with only one type of photography is being compared.